Description: Dressmaking can be a challenge, but our curious Blonde Princess will always have fun doing her hobbies and now she needs your help to create a gown for her new friend, Doll Princess. Step into the princess studio and find the missing objects to clean up the room. 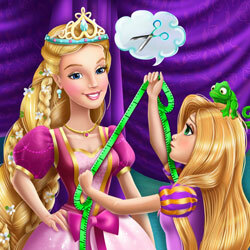 Once you`re done you are ready to make a unique outfit with the princess`s magic tools.